Numerous different blocks can be found on sailing dinghies. They are usually designed for thin lines of no more than eight millimeters in diameter. 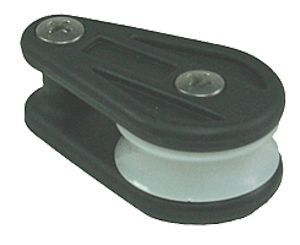 Blocks can be found on sail trim tackle and line leads of all types. Most such blocks are small and equipped with ball bearings. Cable blocks and sheaves are used for the mast when the halyard is not of rope. Working loads are usually superior to those found aboard a dinghy, but this parameter is important to optimize performance. In general, choice will depend on line diameter.